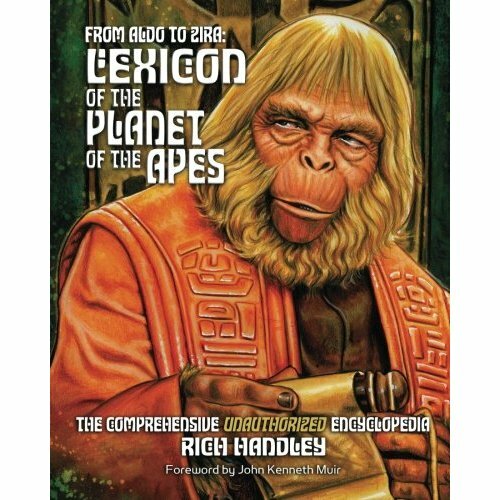 Rich Handley, the author behind the amazing and addictive Timeline of the Planet of the Apes: The Definitive Chronology (2009) is back with a follow-up reference text this holiday season: a complete encyclopedia of the Planet of the Apes saga. It's called From Aldo to Zira: Lexicon of the Planet of the Apes. I've had the good fortune to be involved with this particular text for several months, now. In fact, I penned the book's foreword, and was extremely honored to do so. Rich secured my involvement -- that devil! -- by providing me the text of the lexicon in its comprehensive entirety. This 400+ page encyclopedia is a meticulous, involving, cover-to-cover read that accounts for every single person, place, and thing in the expansive Apes saga. It charts literally every detail of the the original films, the TV series, the comic books, the animated TV series, the 2001 re-imagination, and even the Mego toys (!) of the disco decade. No stone has been left unturned; no Hasslein curve left unexplored. I make it no secret that I consider Planet of the Apes (1968) the greatest science fiction film ever made, and this book adds significant understanding to the ape-o-verse that the Schaffner film so memorably created. The approach that Rich takes -- and which I admire tremendously -- is one of an impartial, omniscient, dedicated historian. He records events without bias; he makes important connections. Entry by entry, he paints for readers a vivid and thorough picture of one possible (fictional...) future. In my foreword for From Aldo to Zira: Lexicon of the Planet of the Apes, I write at length about how I was introduced to Planet of the Apes at a very young age (and a few years before Star Wars) through ABC's "4:30 PM Movie" and how the apocalyptic "future history" of Earth became something of an obsession for me soon after. Like the Timeline before it, this book re-kindles that obsession. Last week, in anticipation of the book's impending release, Rich sent me a handful of PDFs of individual pages (and entries) in the Lexicon, and now I can officially report that the superlative text has been beautifully presented too, by illustrator Pat Carbajal and designer Paul C. Giachetti. The whole thing is simply...dazzling. So before Rise of the Apes arrives in theaters June 24th, 2011, get a copy of this book (now in stock at Amazon.com) and relive every detail of the impressive, epic Apes saga. From Aldo to Zira is more fun than...well, you know, right? Wow, man, I ***really*** appreciate the plug. Thanks so much, my friend. And the honor of having your foreword in the book is all mine, believe me. I look forward (foreword?) to hearing your response to the book once your comp copy shows up. Damn, dirty slowpoke U.S. postal service! I feel very fortunate and happy to be involved with your terrific book. I really loved reading the entire text of the Lexicon, and then getting to see the PDFs of the lay-out and photos. Everyone did a fantastic job on the book. Congratulations! Very impressive tome. I have added it to my watch list. I'm quite intrigued and wish the author well. Funny John, some time before I had the chance to get to know you I too had reviewed the original Planet Of The Apes in a brief review at my site and gave it an easy A. It's a classic and is pretty untouchable on the list. I suppose that's why the remake just couldn't come close. While we're on the subject, do you like the animated series? Is it worthwhile? Thank you. And again, looks like a great book. Hi SFF: Planet of the Apes is an amazing film; one that remains -- in some fundamental ways -- unsurpassed. It usually makes the list of top ten greatest sci-fi films, but I actually put it at the top for its combination of action, sci-fi and timely social commentary (about nuclear apocalypse). When you layer in the great make-up, the terrific sets and the punch-in-the-face Statue of Liberty ending, the movie goes from being simply great to actually a CLASSIC, in my opinion. You know, I do like the animated series and consider it worthwhile. It takes place on yet another version of the POTA, where the Apes of 20th century technology (planes, trains and automobiles). 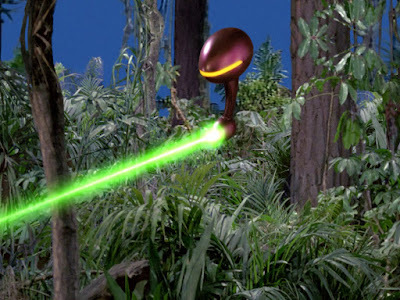 Despite this, the ape characters are familiar: Zira, Cornelius, and Zaius, among them. There's some interesting stuff in the series, vis-a-vis the underground mutants (called "Underdwellers" here) and the recovery of the spaceship in the like it. I haven't watched the whole series in quite a few years (maybe since it came out, around when Joel was born, if I recall correctly...) but I remember getting a kick out of it. I consider it on par with the Star Trek Animated series, if that helps. Both are pretty good! This looks very cool. And with you writing the forward, it makes it something I want to read. Many thanks. Thank you, my friend, for that comment of support. I can promise you: if you buy the book you won't be disappointed. I thought Rich did a terrific job! John, I noted a different cover art on the Amazon book link. Are there different editions, and is your forward piece on all? Thanks. My foreword is for From Aldo to Zira: The Lexicon of The Planet of the Apes. It is definitely there! But I also linked in the above post to the Timeline of the Apes book, which doesn't have a foreword, but which is nonetheless recommended reading! I can't argue with your succinct and perfect summation of why exactly Planet Of The Apes ranks at the top. It's in my Top 10, but there isn't a damn dirty thing wrong with it. It's flawless.